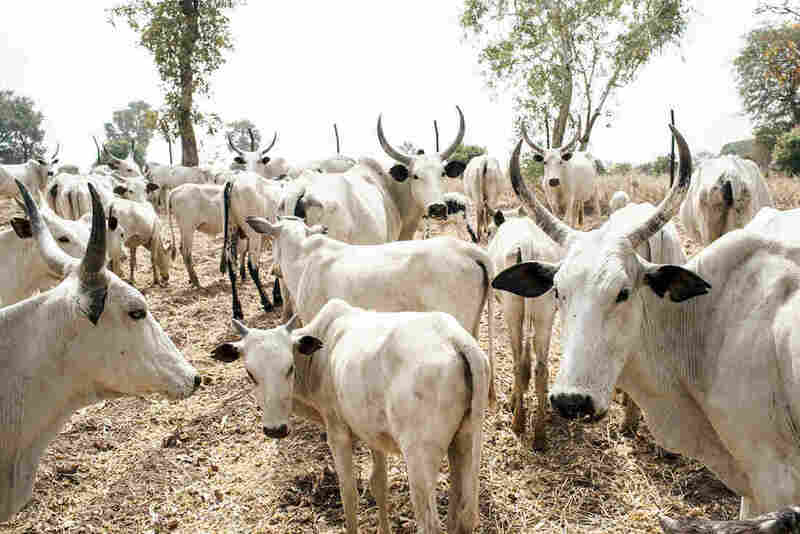 Climate Change Brings Clashes Over Grazing Land In Nigeria : Goats and Soda Nomadic herders who live across West Africa are having to travel further and further south for their cows to graze. Some are letting cows graze on cropland, leading to deadly conflicts with farmers. Cattle owned by Fulani herdsmen graze in a field outside Kaduna, northwest Nigeria in February 2017. Nasir Abdullahi is sitting in a mall in downtown Abuja, sipping fresh juice and eating plantain chips. Small, distinguished with an embroidered cap, Nasir looks like your typical Northern Nigerian businessman, but he's also a farmer. A few years ago he got a call from an employee on his millet farm in Jigawa, Nigeria. "He was even crying when he called me," Abdullahi says. "I said, 'Talk!' He said, 'There is something serious, there is something serious!' I said, 'Did anybody die? What is it?' He said, 'No, it's cattle herdsmen.'" Abdullahi got in his car and drove a few hours to the farm. He learned the herdsmen and their cows had spent the night, destroying some of his crops. Later, his employees told the herdsmen to leave. That's when the fight began. "One of [the employees] was stabbed with a knife and the other one, they beat him up with some sticks," Abdullahi says. In a clash of herdsmen near his other farm in Nasarawa, central Nigeria, it was worse. That time, more than 50 people died. According to Lagos-based security consultants SBM Intelligence, last year more than 1,400 died in these conflicts. Brig. Gen. SK Usman is the spokesman for the Nigerian army. Usman says a lot of the problems come down to land that was originally set aside as a grazing reserve back in the 1960s. "Areas that actually were supposed to be green land are being taken over by populations," he says. "And these were supposed to be grazing routes, so the area is becoming narrow and compressed." Policy analyst Sani Musa says there's also another thing going on. "It's climate change! Even though some people are living in denial of it, but I think we are seeing it," Musa says. The Sahara desert is growing, he says. Lake Chad for instance? "It's just 10 percent of what it was in 1963," Musa says. The nomadic herdsmen who live across West Africa now have to travel farther and farther south with their cows to graze. Musa says that's why many of those implicated in these attacks aren't Nigerian and, instead, come from Niger, Mali, even Senegal. Some Nigerian states have taken action — setting aside grazing reserve for nomads. And the Nigerian senate is talking about a new national grazing reserve bill. But aside from all that — there's an existential discussion going on. In a fancy Abuja neighborhood, on a hill overlooking the city, I find Sani Musa on the phone with a nomadic herdsman who watches his cows. When I ask Musa how many cows he has, he begins to giggle. "Well, you know, normally a Fulani does not say his cows. Because it's like talking to you about my account in the bank," he smiles. "But I have a lot." Musa's cows are nomadic, they move all over northeast Nigeria. But some cattle owners are saying, enough. They now keep their cows in one place to minimize chances for conflict. Another cow owner, Abba Abubakar keeps his cows in two places — near Yola in Adamawa state and in Gambu in Tarawa state. But he says his cows always stick to one piece of land. As for Musa, his cows will stay nomadic for now. He says it's important to remember that being a nomad is a way of life. "You cannot legislate it out of existence," he says. "You have to convince these people, and a lot of them feel it's the philosophy of their existence." Still, given the conflicts over land and water, he knows which way the nomadic way of life in Nigeria is headed. "It will be part of history, I know," he says. But, someday, the nomads may be able to find videos of their past on YouTube. "They will teach their grandchildren, 'This is how we used to be,' " Musa says.